The Optomap Retinal Exam provides a panoramic view of the back of a person’s eye (the retina). The view provided by the Optomap displays over 80% of the retina. How does the Optomap work? The patient places their eye to be photographed up to the instrument and the doctor’s assistant positions the patient for the photograph and takes a picture. The Optomap captures its image in only ¼ of a second. The photographer may take several images of each eye for the doctor to evaluate. The Optomap® Retinal Exam is a great tool to use in addition to dilation or when a patient can't, or doesn't want to be dilated. In some cases the view provided by the Optomap is superior to that of pupil dilation. For example, a patient that is very light sensitive will often refuse to have their pupils dilated because of the inconvenience they experience. The dilated view of a very photosensitive patient is often poor because it is difficult for the patient to keep their eyes open or to look in the appropriate direction. The Optomap captures images with a brief flash that even light sensitive patients do not object to, allowing the doctor to view the results without discomfort to the patient. 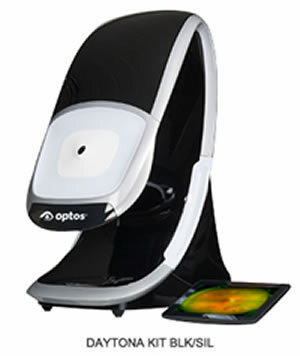 The Optomap allows for a more comfortable retinal exam. For whom is the Optomap Recommended? The most important advantage of the Optomap is that we can acquire a detailed image of the inner eye including the optic nerve, retinal vessels and peripheral retina and document the status. More importantly we can monitor your internal eye health over time. Also anyone with a history of eye disease such as diabetic retinopathy, macular degeneration and glaucoma can be monitored more accurately. These photos remain part of your permanent clinical record which gives your doctor comparisons for tracking and diagnosing eye diseases at the earliest possible time.